This morning in church, many of us throughout the United States joined in solidarity with the congregation at Mother Emmanuel African Methodist Episcopal Church in Charleston, SC by singing the great hymn, “Lift Every Voice and Sing” (#599 in The Hymnal 1982 if you’re Episcopalian like me; the text is by James Weldon Johnson and can be read at poets.org). I don’t know about heaven, but earth does not yet know the tune, much less the harmonies. We have work to do. So the triumphant-sounding words in the hymn, which sprang so easily from the tongue in 2009 when our nation elected its first Black president, felt a little flat today. We were gathered as community to celebrate: that’s the term we use when speaking of the Eucharist. It’s a memorial of Christ’s death and resurrection, and we celebrate it. Our story, as people of the Christian faith, looks death squarely in the eyes and takes it on, in the “sure and certain hope of resurrection.” On any given Sunday, that resurrection faith is easy to sing. But this week, we were made keenly aware that we are still, in the words of the hymn, “treading our path through the blood of the slaughtered.” It was difficult to sing. “No,” I wanted to reply. The hymn refers, in past tense, to “the day when hope, unborn, had died.” Yet it feels like we’re living in such a time. Reflecting on the contradictions we were singing, I recalled the words of Harvey Milk: “You gotta give ’em hope.” Biblical scholars often encourage us to interrogate the text of Scripture by asking, “Where’s the good news?” It’s a question we should also ask while looking out at the world trying to find what the Spirit is doing, and another way to word it is, “Where’s the hope?” Today’s hymn, I think, is actually quite useful in training our vision to see hope where it seems to be absent. There’s no denying that, even though we keep retreading the same stony road, we are “already and not yet” in a place for which our ancestors hoped. Ground really has been gained, no matter how much journeying still needs to be done. Today’s triumphant-sounding hymn carries that sense of the “already-and-not-yet” by proclaiming a bright future even while acknowledging a “gloomy past.” That in-between stretch of road that spans from hopeless past to future promise continues to be watered with tears but also continues to point us toward the consummation of our hope. …By faith Abraham obeyed when he was called to set out for a place that he was to receive as an inheritance; and he set out, not knowing where he was going. By faith he stayed for a time in the land he had been promised, as in a foreign land, living in tents, as did Isaac and Jacob, who were heirs with him of the same promise. For he looked forward to the city that has foundations, whose architect and builder is God. …All of these died in faith without having received the promises, but from a distance they saw and greeted them. They confessed that they were strangers and foreigners on the earth, for people who speak in this way make it clear that they are seeking a homeland. If they had been thinking of the land that they had left behind, they would have had opportunity to return. But as it is, they desire a better country, that is, a heavenly one. Therefore God is not ashamed to be called their God; indeed, he has prepared a city for them. Our “native land,” to which we pray in today’s hymn to stand true, is that city “whose architect and builder is God.” We’re not quite there yet, but we catch glimpses, especially when we gather together to celebrate the Eucharist. May we remain true to that native land, and bring along with us whoever we meet along the stony road. *The Hymnal 1982 changes the word “fathers” in the original poem to the gender-inclusive “parents.” You know our mothers were sighing, too! Maybe more, even. Since I don’t seem to have the time right now to sort through and edit, in order to share, my Detroit photos, I thought I’d at least stop in and post something. This is a bit of a flashback—I published it as a facebook note on May 24, 2011. I’m not normally one to argue with a bishop (although a facebook note is hardly arguing), but the sermon we heard on Sunday for the celebration of the 100th anniversary of the completion of the Cathedral Church of St. Paul’s building has gotten me thinking, and talking, quite a bit. That’s good—that’s what a sermon should do. And I don’t totally disagree with what the Bishop said, I just want to nuance it a bit, or maybe just deepen part of it with further reflections. At any rate, his sermon is the occasion for me writing some thoughts I’ve been having anyway here in this note. Bishop Wendell Gibbs (Diocese of Michigan) remarked in his sermon that buildings are a curse: they require so much effort and so many resources for upkeep, and they can lock us into certain styles of worship (in the case of a church) rather than allowing flexibility and adaptation. Bishop Gibbs’ primary concern in this regard is mission, and he’s absolutely right that there is a danger both of becoming complacent inside a lovely building during worship hours rather than going out into the streets and into the world and being the Church there; and of draining our resources on the building’s upkeep so that not enough is left for growth and ministry. And that was his primary focus: the “living stones” that should not merely be contained inside stone buildings. It wasn’t a sermon about architecture. However, when he said that “buildings are a curse,” after chuckling knowingly a bit, I instantly thought, “so are bodies!” I don’t know about you, but my body requires a lot of upkeep, especially the older I get. I have to devote a lot of time to sleeping, eating, grooming, working for a living, and so forth; I have to spend a lot of money on food, clothing, shelter, transportation, and health care—and despite all of this expenditure, my body still disappoints me constantly! It’s quite a bit bigger than I would like; it’s not terribly flexible; it burdens me with health issues from eczema to bipolar disorder. It limits me to whiteness, femaleness, a certain height, and having to be in only one place at a time. It is weighted down by gravity and worn out by use and by the elements. And yet my body is precisely my means of being in the world. Without my body and all of its draining requirements, I can’t interact with others, enjoy tastes and smells and sights and sounds, or even know anything at all, since all of our knowledge is mediated by our senses. Buildings, in fact, are very much like the human body. Buildings and bodies enjoy a certain connaturality. Buildings are built precisely to house human bodies and activities. Because of this, much of what we can say about buildings can also be said about our bodies, and vice-versa. Our buildings are how we as communities exist in the world. We build grandiose civic buildings not (primarily) to display wealth and privilege but to use wealth in the service of facilitating and celebrating the civic project—our common life. We build homes as dwelling places and decorate them to celebrate family (however configured) and to situate us in a neighborhood, as well as to accommodate all the provisions we need. We build houses of worship to not only serve as a meeting place for like-minded people, but to celebrate and exemplify our common faith, our love of God, God’s love for us, and the community God has made of us. Furthermore, houses of worship serve sacramentally as visible and tangible reminders of the “cloud of witnesses” St. Paul talks about—all the saints, known to us and unknown, who have gone before. In a church, for example, windows and fixtures have been given by members in the past (who have or had lots of money, and whose names are usually inscribed on the gifts), but these fixtures have been used and cared for by those who have gone before us as well as those currently in our midst, and we will pass them all on to others. You can touch the back or end of a pew and know that others have done the same over the years, and that many dedicated individuals—sextons, vergers, clerks of the works, Altar Guild volunteers, or whoever—have lovingly cleaned, polished, restored, and protected them. These objects witness to our bonds given in baptism, nourished in the Eucharist, and deepened by common worship and life. They do drain our resources, but they can also serve as signs of the risen Christ in our midst, since without him, none of these things, these material objects, would have been put together and used as they have been. And his Incarnation, which comes with death attached (as our own incarnations do) and his Resurrection have hallowed all created matter so that materiality has been taken into the very Godhead. “What was from the beginning, what we have heard, what we have seen with our eyes, what we looked upon with our hands concerns the Word of life,” writes St. John in his first epistle, “for the life was made visible; we have seen it and testify to it and proclaim to you the eternal life that was with the Father and was made visible to us… [NAB].” God who is beyond all space and time, who revealed Godself as the God of Israel, could not be contained in a physical dwelling; but in Jesus God ate and slept, suffered death, sloughed off dead skin and excreted waste, and was limited in every way all human beings are. This was his way of being in the world. It is the “scandal of particularity,” from which neither we nor our buildings are exempt. Our buildings are our means of being in our communities, and they help to form us in the faith. Even—or perhaps especially—when we bruise ourselves against the walls trying to make the building fit whatever we want to do in it (as liturgies change, e.g. ), our buildings also remind us of our own particularity, with all the limitations and mortality our creatureliness entails. Like us, buildings adapt to new situations with mixed success. Like us, our buildings show their years, and, if we have the spiritual senses to perceive it, they get better with age. Wear comes from use, and years of prayer deepen the sacredness the church building already had upon its dedication, just as the years that show in our bodies’ wrinkles and scars have deepened the christliness we received in our baptism. Burden, yes. Curse, yes. Blessing—yes, yes, yes! I can’t say too much about this restaurant, since I’ve only been there once. We had brunch on the Sunday of my visit to Detroit and, as I’d mentioned a couple posts ago, I had strep and couldn’t swallow very much. Which was a shame. The pancakes I’d ordered were delicious. 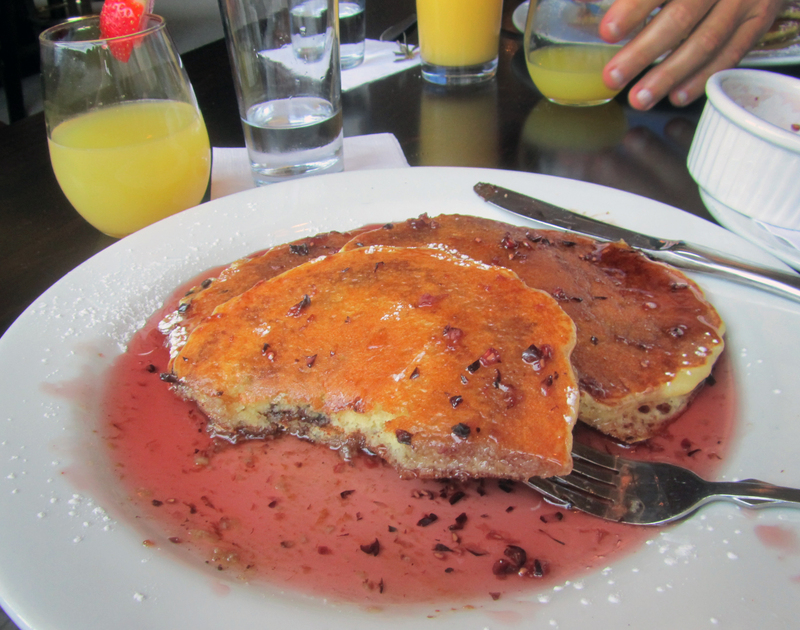 Chocolate chip pancakes with a berry-infused maple syrup, and a mimosa to drink. My friend Paula had planned on our eating here for Sunday brunch, since we were meeting my sister and her boyfriend. It’s a place she’s been impressed with. There weren’t many people in the restaurant when we arrived, and only a few more when we left. The area where we were sitting was very brightly lit, thanks to the building’s large windows, but based on the rest of the interior, it seems to me like more of an evening venue. 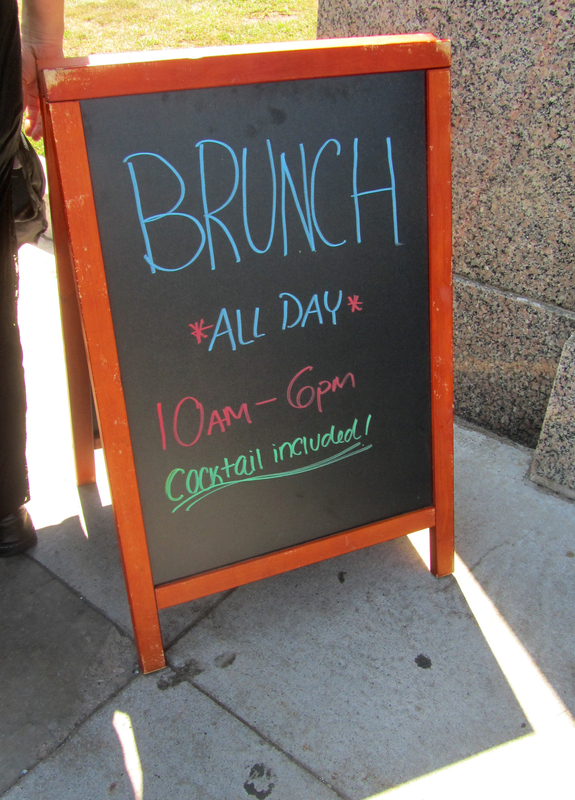 However, I didn’t see any non-brunch menus. But you can check them out here! The server walked into the frame just as I pushed the button. I do that all the time at my job, too. The service was excellent. So were the mimosas, which came with brunch. Sunday in Midtown: Brunch all day, complete with cocktails! 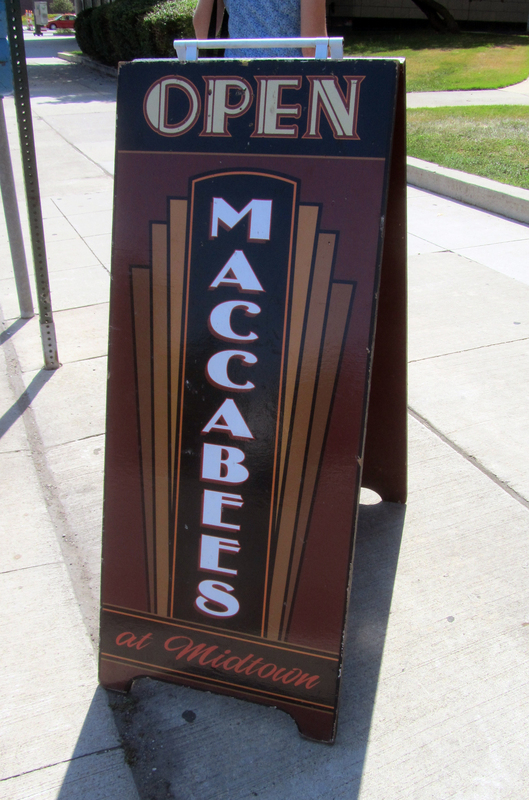 The restaurant is, as the name suggests, in the Maccabees Building, which is owned by Wayne State University these days. (It used to be owned by the Detroit Public Schools.) 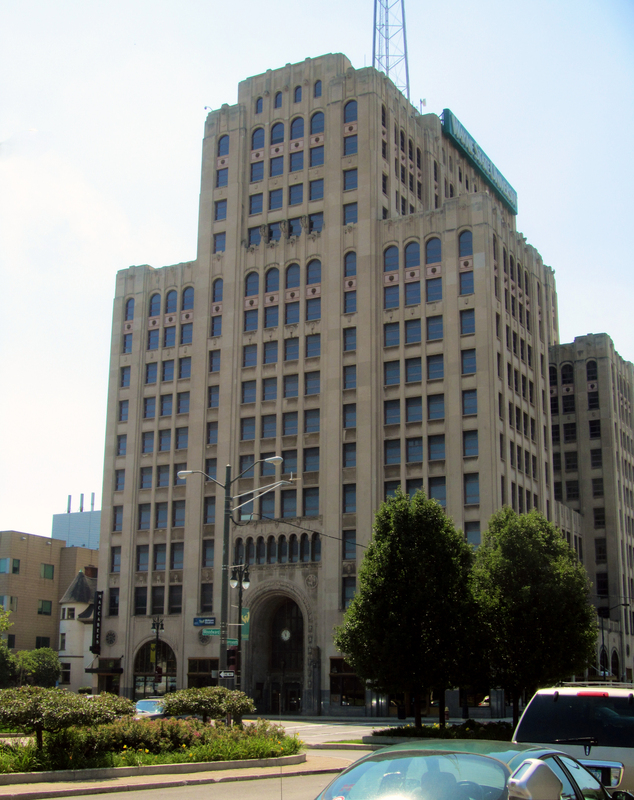 Adjacent to the WSU campus, it is located in that part of Midtown otherwise known as the Cultural Center, because of all the cultural institutions there: the Detroit Institute of Arts and Detroit Film Theatre, the Detroit Historical Museum, Wayne State University, the Detroit Public Library‘s main branch (which houses the Burton Historical Collection), the Michigan Science Center (formerly the Detroit Science Center), the Charles H. Wright Museum of African American History, the Scarab Club, and the College for Creative Studies. Am I forgetting anyone? Well, the Maccabees Building is kitty-corner from the Cathedral Church of St. Paul (Episcopal), which is worth a visit, if only to see its Pewabic tile floors. So here’s my suggestion: Go to church at the cathedral (beginning this fall, the main service is at 11:00 on Sundays), have brunch at the Maccabees, then go to a museum or two. The DIA will absorb a whole day quite easily, and you still won’t have seen everything. 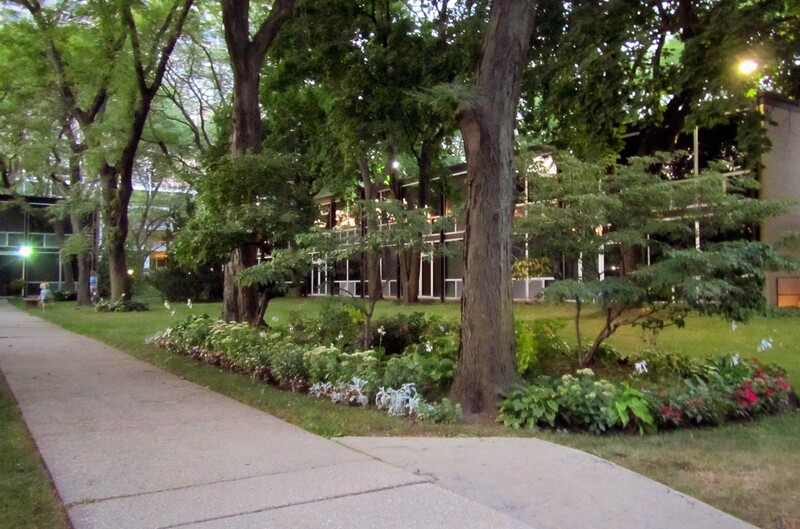 If you’d rather breeze through a couple museums, I think the Detroit Historical Museum and the Charles Wright Museum of African American History would go together nicely, although you could spend an afternoon at just one of them as well. The Maccabees Building, taken from across the street at the DIA (near the Farnsworth entrance). The restaurant is located just to the left-hand side of the large, front door in this photo—conveniently right off of Woodward. I still wish I’d been well enough to finish off those pancakes. They were delicious. I guess four posts from Detroit in the seven days I was there isn’t bad, but I meant to do more. The second week of my trip, I was outstate (DeWitt and Hamburg), and didn’t have consistent internet access, so there were zero posts. Don’t worry, I’ve still got plenty to share with you! But here’s what happened. While in Detroit, I was not only busy (though, as you’ll see, not as busy as I would’ve liked); I succumbed to that pesky little streptococcus bacteria I’d apparently (based on the incubation period) brought with me from California. At first, I thought it was an allergy attack: unless strep begins with an itchy face, eyes, and nose, and the opening of a spigot from your sinuses, I really did have an allergic reaction to my former-now-annual roommate’s cats on the Wednesday night of my stay (I flew in overnight on Sunday, arriving Monday). 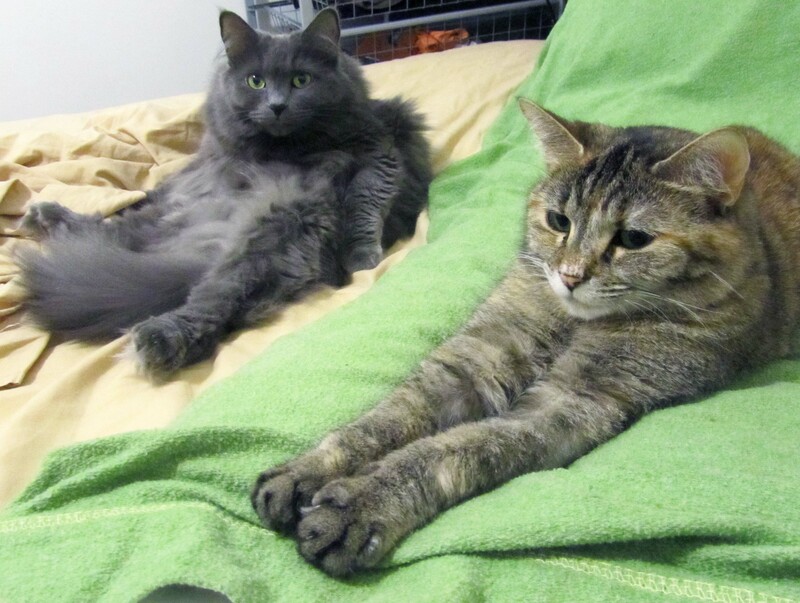 Carnivorous allergens sharing the bed with me. Thursday, I woke up with a dry, raw throat, as you do after serious post-nasal drip, so I didn’t think much of it. But it became sorer and sorer as the day progressed. By Thursday night, I couldn’t swallow without flinching (and tearing up a bit), and my tonsils, glands, and neck were quite swollen. (In my defense, my tonsils are always pretty big, and they never developed that distinctive appearance you associate with strep. And because it was August in Michigan, and I’d just come from temperate Northern California, I had no idea I had a fever! I just thought it was hot outside.) I spent Friday mostly in bed, having canceled lunch plans with a dear friend I haven’t seen in years. In the evening, I stayed home from my former choir director’s birthday party in Lafayette Park. My roommate had brought me saline nasal spray and Chloraseptic spray when she came home from work, and I spent the evening flushing my sinuses and trying to get that red liquid to stay where it hurt for at least 15 seconds before spitting it out (per the directions). I also took lots of acetaminophen, as hard as it was to swallow. I might have gone to a doctor, but being in a different state from my HMO complicated matters. I emailed my allergist and described everything (stressing not only the cats, but that I’d been on a plane where it’s easy to pick up nasty stuff), and he also thought it could be allergies. He said if it didn’t improve over the weekend I should go to urgent care. I figured getting out of the house with the cats in it might help sort that out. So Saturday morning, I felt only marginally better, but would not be deterred from my plans to spend the day at Eastern Market (before heading to Lafayette Park for another party—this one a housewarming. I’m tempted to claim there’s a party of some kind every night of the year over there, but it’s actually a rather quiet neighborhood). Sunday morning, I felt so lousy I almost wanted to skip church. Seriously, I was contemplating skipping the highlight of my annual trip home, going to Mass at my home church, where I became an Episcopalian—the Cathedral Church of St. Paul. 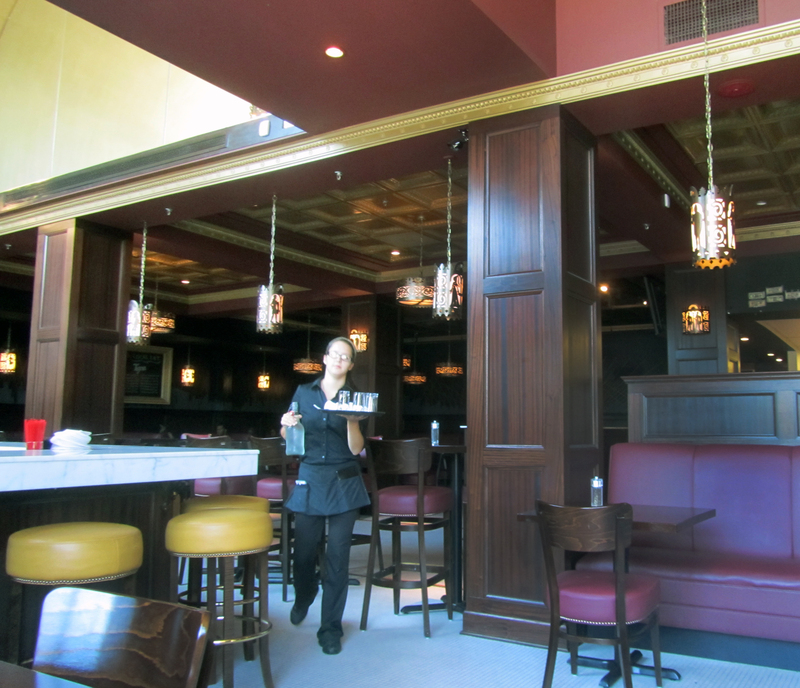 But my sister was coming with her new boyfriend (“I wanted him to meet you in your natural environment,” she’d joked) and we were going to brunch afterward across the street at Maccabees at Midtown (in the Maccabees Building, where you might expect it to be). Needless to say, I was glad that I went to church and brunch (although I could only manage to swallow one of the three pancakes I ordered). I so love the liturgy at St. Paul’s, and it was good to see everybody. There are more people there I don’t know now than that I know, which strikes me as a good thing. It means new people have been coming since I left! Anyway, after brunch, I decided it was time to go to urgent care. Well, almost. First, while my roommate went to fill her gas tank, I popped into the DIA to exchange a t-shirt I’d bought on Thursday (not noticing the handwritten amendment to the size on the tag). I noticed the Scarab Club was open, so I walked over to take a peek inside to see what was going on (just a gallery show, pretty quiet)…and twisted my ankle a little in a pot-hole on the way back. Pro tip: clogs are great for plantar fasciitis, but not so much for walking outside when you’re prone to tripping anyway. Where to go for urgent care on a Sunday? Well, the DMC campus was right there, so I wound up in Emergency at Detroit Receiving. Such a beautiful day to go to the hospital. I’d never been there before, although a friend of mine works there as an OR nurse. From what I could tell, it’s a pretty large, potentially high-volume facility. 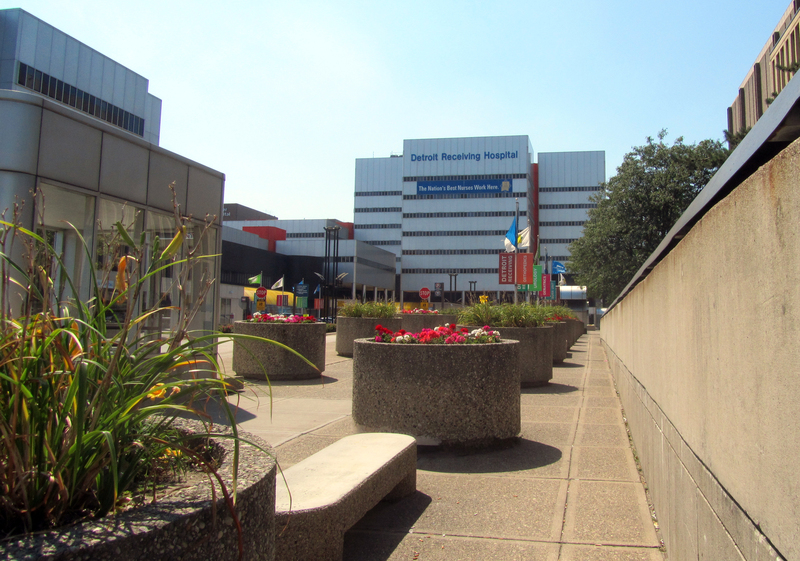 It wasn’t terribly busy, or terribly well-staffed in triage (only one nurse), but even though things moved along pretty slowly, the staff were all very professional, friendly, attentive, responsive, and thorough. Once I was getting treatment, I was chatting with another woman, who was there with a foot injury. She’d dropped a glass vase on her foot, and cut it open. After the stitches, they also caught a small fracture in one of her foot bones and sent her out with a splint and crutches. In my personal experience (breaking my elbow last year), that sort of thing can be easily overlooked. There was also another woman there with strep, only she was clearly sicker than I was. Now that I know I probably contracted it in California, what are the odds of that? The doctor gave me some liquid codeine and a prescription for more, which I didn’t fill (it wasn’t miraculous enough to waste money on). The nurse offered me the choice, for penicillin delivery, of a short course of pills or a one-time shot. One-time anything sounded good to me, and I certainly didn’t want to swallow any more than necessary. She said, “Oh, I’d take a hundred pills to avoid a shot.” As I started to point to my tattoo and say, “Ah, I’m not bothered by needles,” she uncapped the thickest hypodermic needle I’ve ever seen, which was also at least an inch and a half long. I actually had to look away for a second. I felt the poke, and then watched her insert the whole length of that needle into my mid-thigh. I wound up with a humongous bruise, but the sore throat faded within about 24 hours. Ahhh…. But that’s not at all the way I’d want to become a legend. Luckily, no one seems to have caught my strep (as far as I know). It made me miserable, but it didn’t ruin my trip home. Nothing has that power. So I’ll continue with the posts I would’ve been making a week or two ago, had I not gotten sick.